A harbor cruise tour is one of the best things you can do in San Diego. You can get away from the hustle and bustle of all those tourist spots you've been visiting You can rest your feet and get some great views of ships docked beneath San Diego's modern skyline, or you may get to watch sea lions lounging on a buoy. Another reason to take a harbor cruise is for what you can learn from your tour guide or captain, especially how closely the city is tied to its maritime heritage. If you want to go whale watching, the harbor is not open to the ocean, and a harbor cruise is not the way to do it. For that, you need to take a San Diego whale watching cruise instead. One- and two-hour San Diego harbor cruises leave from the waterfront near the cruise ship terminal on Harbor Blvd. The cruises travel from there in two directions which they call North Harbor or South Harbor. Each one lasts an hour. 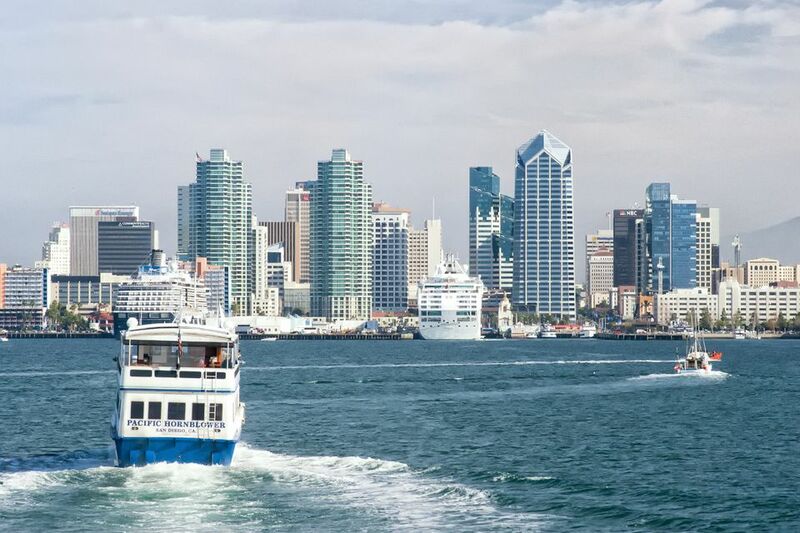 On the North Harbor cruise, you will see the San Diego skyline, the Star of India and other ships at the Maritime Museum, Harbor Island, Shelter Island, and the North Island Naval Air Station. The South Harbor cruise goes past the Coronado Bridge, the U.S.S. Midway Aircraft Carrier, the Navy Seals Training Base and ships of the U.S. Navy Surface Fleet. Each one lasts an hour, but which of those options is more interesting depends on your interests. A two-hour tour costs only a bit more than a one-hour one, making it the best choice if you have time. Two companies offer San Diego harbor cruises. If you're in San Diego on Sunday, you can take a brunch cruise with either of them. Flagship Cruises is a family-owned company that also operates the Coronado Ferry and water taxi. They partner with the Birch Aquarium to offer whale-watching tours and provide a dedicated narrator on every trip. Hornblower Cruises offer more comfortable seating and more room to sit inside out of the wind. You can see the sights and get a meal all at the same times. Check the Hornblower website for more information. For a more exciting harbor tour — but one where you won't have much time to see the sight around you — try the Patriot Jet Boat operated by Flagship Cruises which takes you on a high-speed, 30-minute ride in an open-air speedboat. Adventure Rib Rides in a rigid-hull inflatable boat (RIB) which has a hard fiberglass hull surrounded by inflated pontoons for extra stability. Wednesday afternoons are particularly good for a San Diego harbor cruise, when lots of local sailboats may be out for the weekly "beer can" races. The local yacht club's "opening day" also brings out the boats for a big race. Take layered clothing along on your harbor cruise. It's always colder on the water than on land, and even if the weather is warm when you leave the dock, fog can come in quickly, and the temperature drops with it. Don't forget sunscreen and water, and something to tether your hat, so the strong breezes don't rip it off your head. To avoid traffic and parking hassles, take the San Diego Trolley to Santa Fe Depot and walk to the bay cruise dock. You can usually buy tickets at the dock until a few minutes before the boats leave, but that approach might leave you disappointed. Especially if you get there right after a big group tour show up. They can sometimes fill up an entire boat. The Go San Diego Card may also save you money on your harbor cruise. It offers a lot of attractions — including a harbor cruise — for one discounted price. Use this handy guide to find out all you need to know about it. One of the cheapest ways to get a harbor cruise is through Goldstar. Find out what Goldstar is and how to use it.